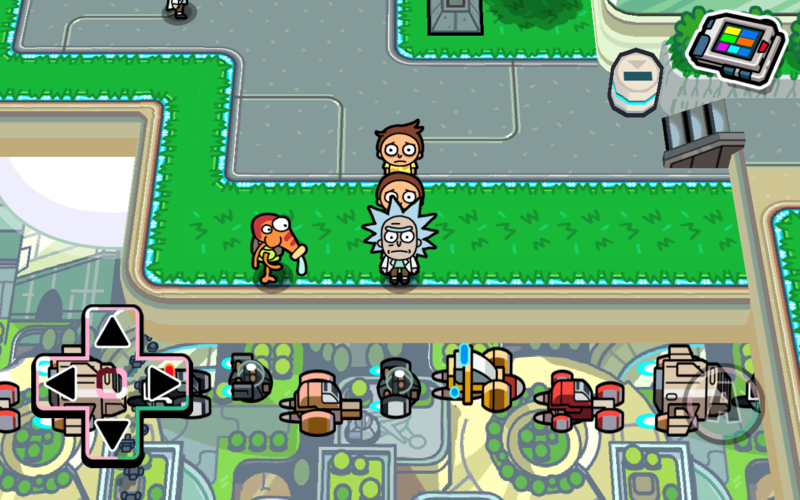 [Review] Pocket Mortys - Just keep shooting, Morty! They're bureaucrats. 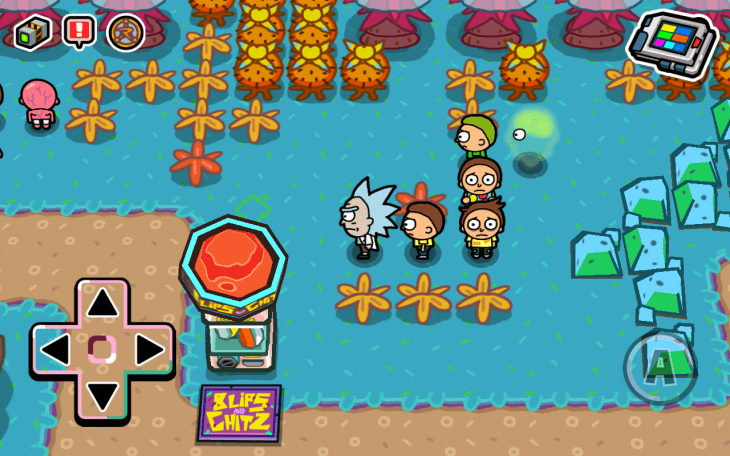 [Review] Pocket Mortys – Just keep shooting, Morty! They’re bureaucrats. 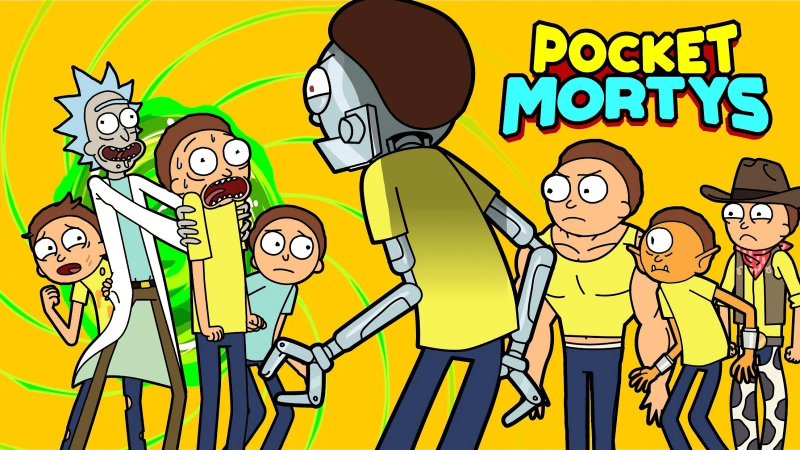 If you haven’t watched Rick and Morty from Adult Swim, yet, you probably will binge it now that you play Pocket Mortys. Needless to say whoever is a fan of the animated series hopped on the bandwagon when the game launched last week. The show is adults-only, massively and ruthlessly politically in-correct, offensive and repulsive. It’s also hilarious, remarkably witty and sometimes even sentimental. It’s about a depressed alcoholic who is also a scientist displaying the “diagnosable qualities of various mental illnesses.” He travels the dimensions with his troubled and deeply traumatized grandson Morty, who is a sweaty 14-year old who just wanted to get… you know what they want at that age. In the meantime, the duo gets into all sorts of troubles. Adult-style. It’s a sort of a wicked parody of Back to the Future and Sliders. However, the freemium mobile game has been considerably toned down to look and sound decent and the younger audience may get totally glued to it. So, chances are we will see a lot more seasons of Rick and Morty because the audience must grow considerably thanks to this wonderful time killer. You play as Rick of dimension C-137, the Prime dimension, and Morty, the Mortiest Morty also dubbed Prime. 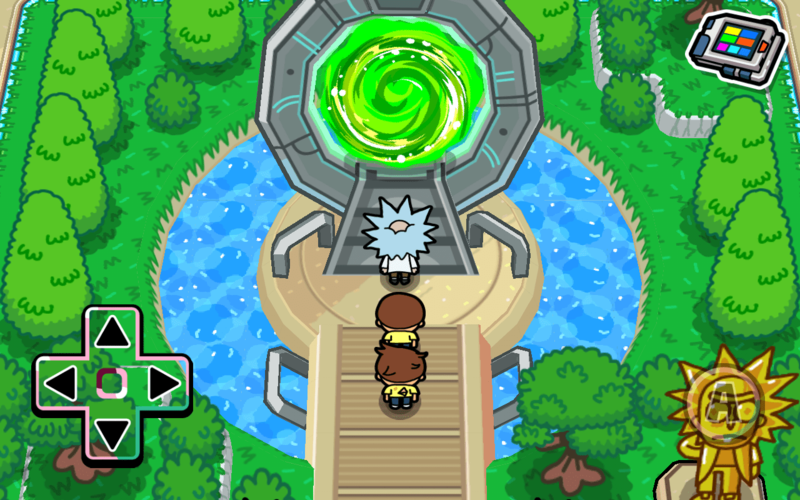 They find out all Ricks get separated from their Mortys throughout all the dimensions, so you decide to find out what’s up and put this to an end. Before you do, however, you are being arrested by the council of Ricks, as they deprive you of your portal gun. So, now you can’t travel back to your dimension. To get your gun back, you need to assemble the stray and lost Mortys throughout the dimensions, train them in battle and defeat the members of the council of Ricks. Only then will they grant you the right to wield a portal gun and the two of you can go back home. Since going home was never the gist of the show, neither it is in the game. The gameplay is basically Pokemon. You and Morty travel to different dimensions, battle other Morty trainers, then find the portal, battle the boss fight against the Rick of that dimension and his team of Mortys, get back to the Council of Ricks and its suburbs. This is where you can restore the health (HP) and attack points (AP) of all your Mortys, as well as deposit the extra Mortys to the daycare center, or combine the two or more Mortys of the same kind into one, but more powerful. 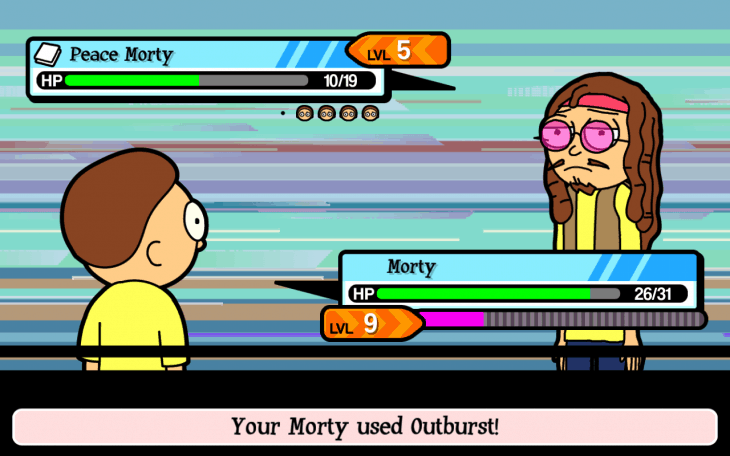 The battle is a turn-based one on one duel between your Mortys and those of your opponent. The basics you need to know is Mortys come in three types – rock, paper and scissors. So, whenever you see the next Morty of your opponent and the icon that signals its class, you can switch to another Morty of yours to be of the superior class. The Mortiest Morty has no class. Hence, he is a universal weapon against all other Mortys, but neither does he have any special power against any of them. 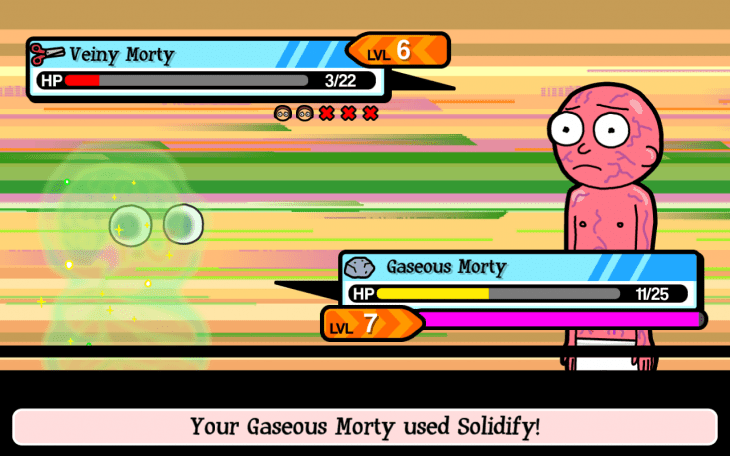 Each defeated, or dazed, opponent’s Morty gets your Morty more XP, so they level up. Each won battle gets you some loot – Schmeckles, energy potions, XP seeds, inter-dimensional slime and all sorts of cans, wires and batteries you will need to craft stuff. You craft stuff in your lab, and the trick is you don’t know the recipes. Each recipe has 2-3 ingredients, no more. So, the fun part is to try and combine the ones you have to see if you can make something of use. Or, you could browse the Internet for the recipes. 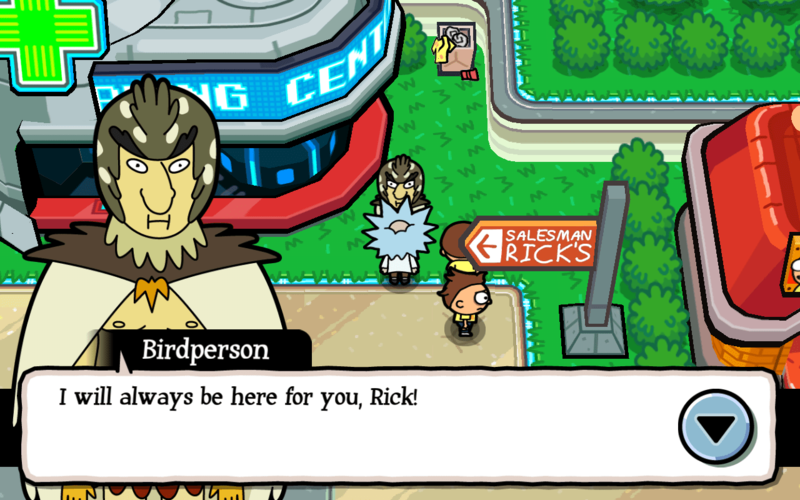 There is also a shop where you can buy all the things – healing serum, seeds, Morty Pads and all that scientific junk you win when you battle. 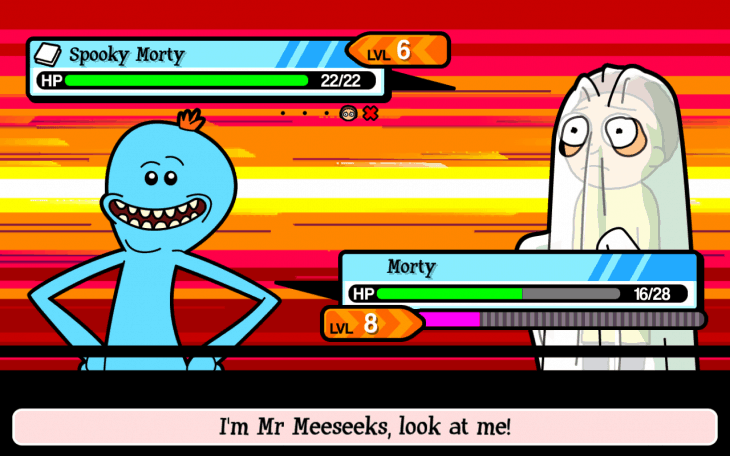 That’s one distinctive feature of Pocket Mortys – its IAP system is done right. Even though the amount of Schmeckles you earn by fighting is not exactly proportionate to the amount of serum or seeds you need to clear a dimension. However, the assortment of stuff in the Shop has everything you earn by playing, so there does not seem to be a pay wall. Also, you can watch short video ads in exchange for some 30 Schmeckles while a healing serum +20 costs 250 Schmeckles. Besides crafting stuff, you can capture stray Mortys. To capture one, you need to have a Marty Pad, which is a chip that converts a stray Morty into your Morty. To perform the procedure, you also need to fight the stray Morty, just make sure you don’t beat the hell out of him because you won’t be able to capture a dazed Morty. You can have up to six Mortys on your deck and the extra ones go directly to the daycare center. Whenever you have two or more of the same type, you can combine them. There are over 80 types of Mortys, and even though some say the gist of the game is to capture all of them, I feel like it’s wiser to capture more of the same type to combine and make them stronger. 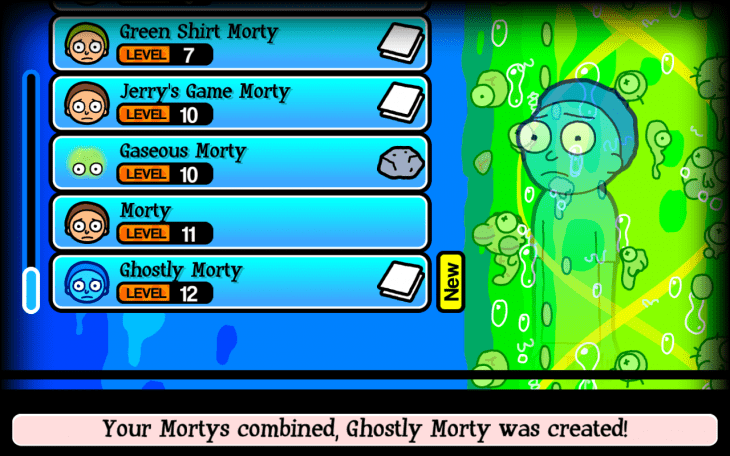 That’s not always a good tactic because you unlock new Mortys every now and then. After you defeat a member of the council, you get a coupon for a Blips and Chitz machine, which grants you decent loot and a new Morty. 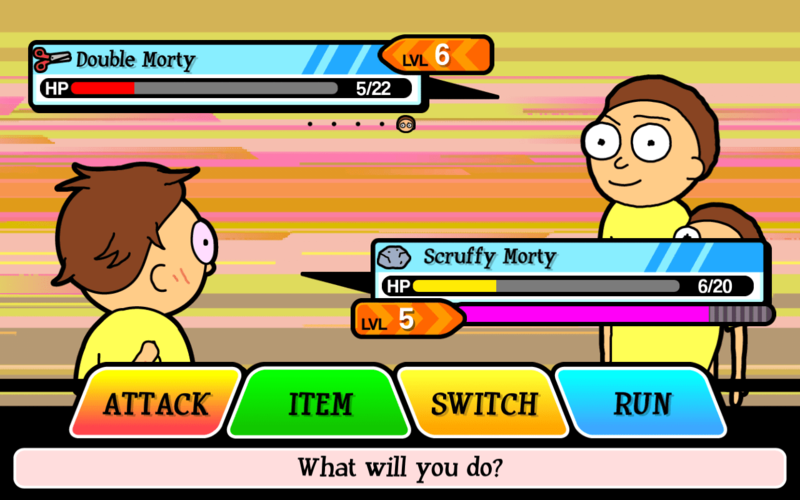 Just make sure to have Mortys of all types. There are also side quests and a healing center, which is located where the Council is. That’s the only place you can restore the AP and HP of all your Mortys for free. 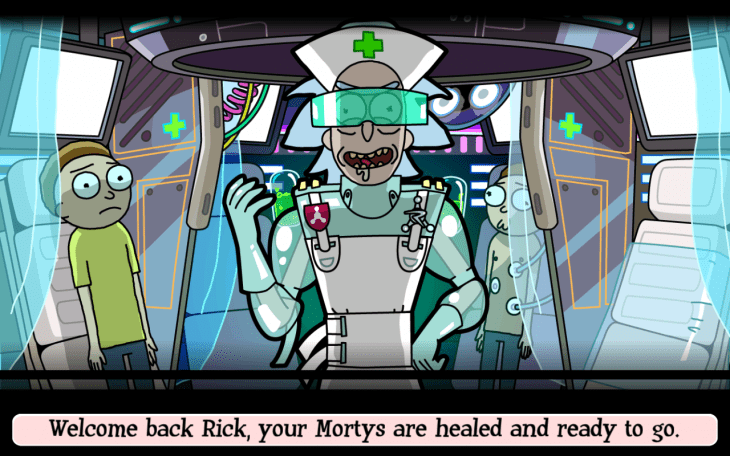 If all your Mortys get dazed in a battle, Rick faints gets teleported to the healing center, no badge won. Each boss fight grants him a badge, and when he reaches a certain number of badges he can battle the next council member. Phew, I keep seeing Mortys even when I go to sleep. 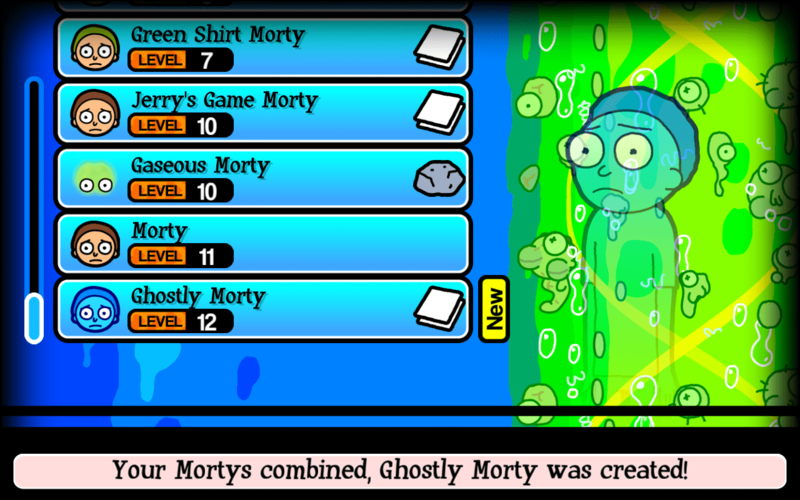 Besides the great deal of Mortys and recipes, Pocket Mortys features a juicy and colorful design with a lot of fine and hilarious details. Even though the dimensions and random encounters get a bit monotonous after a few hours of continuous play, the game is addicting. Even though the fans of the show might miss the explicit verbiage of the original show, the game is fun and funny enough to let the younger audience play without learning a few extra bad words. The music is fun but not distracting and quite in tune with the show. You will also meet some of your favorite characters while the voice-over is spot on. It’s an atmospheric experience. Sometimes I feel the turn-based battle gets out of sync with my commands. Other than that, the performance is smooth. Lots of Mortys and Ricks, Ricks and Mortys forever and forever. 100 years, Ricks and Mortys’ things. Ricks and Mortys running around, and Ricks and Mortys time. All day long forever. Pocket Mortys gets all the important things right. It's Ricks and Mortys, all day long forever. It's fun to play - what else do you need?